Rather than committing to painting your cabinets or choosing a crazy-colored appliance, infuse color through your accessories, like in this kitchen space spotted on Design*Sponge, who ran with teal and light blue accents via vases, plates and tabletop appliances. The consistent palette keeps a small space feeling organized and well thought out. This one is particularly useful if you find yourself in a studio where every room kind of just spills into the next. Should you have a window in your teeny kitchen, consider adding draperies, which will invite the same coziness your living room (which very well might be inches away such as in this space by Moodhouse Interiors) offers, encasing you in purposeful design. In a small kitchen, you only have so many opportunities to flex your creative muscle. Here, in a kitchen from Dzek (which features the company’s Marmoreal countertop) a terrazzo-like surface, though not for everybody, really steals the show. What you see isn’t always what you get, or at least that’s the takeaway in this small kitchen found on Architectural Digest. With no hardware in sight, the walnut paneling hides a full-size refrigerator, making the compact room feel larger without the visual interruption of a bulky appliance. Small European apartments are always a wonderful place to seek out inspiration for your compact home spaces. 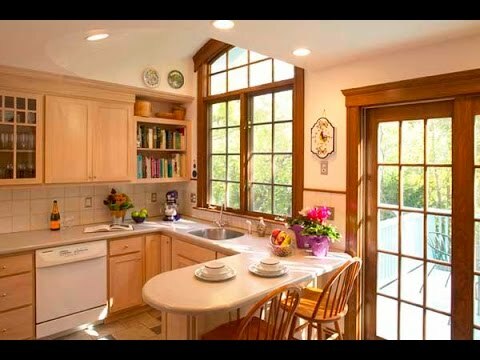 Turns out, so is Detroit, at least by the looks of this kitchen. 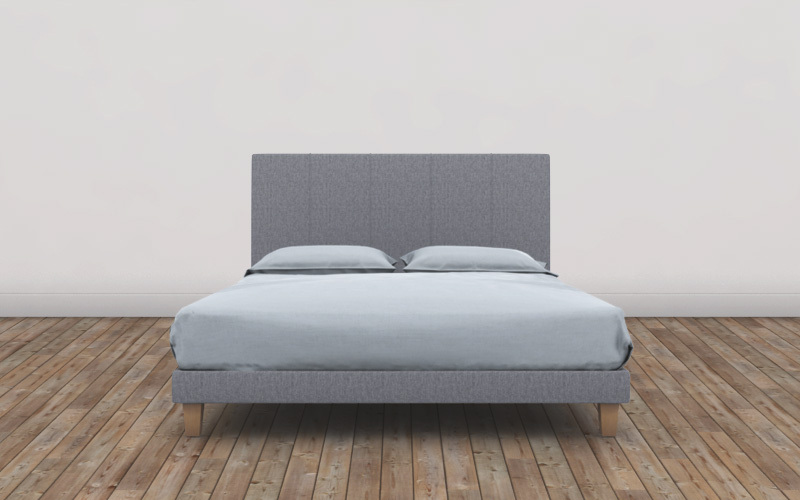 The Scandi-style material and color palette works well to keep the room open and visually pleasing. In this super small Parisian kitchen, designer Marianne Evennou channeled her inner librarian, creating upper storage that mimics the beloved card catalogue. This little galley kitchen found on Marie Claire Maison does an impeccable job of mixing traditional elements like the Aga stove, classic French moldings and crystal chandelier with streamlined cabinetry, floor-to-ceiling geometric tiling and a modern sconce. Every kitchen, no matter how big or how small has one thing in common: a stove. A four-burner range or cooktop can take up a majority of counter space, even though it gets used, at most, for a few hours a day. Sacrifice one burner and add a tray (on little legs to sit above a coil burner if you have one) to hold everyday spices like salt and pepper (and even a little plant). Uncovered on A Beautiful Mess, this pint-size kitchen really takes advantage of its wall space by adding in another shelf under the upper cabinets and even a metal rack above the stove for tools and utensils. Keep the kitchen cozy and full of style with a vibrant vintage-style rug, like this one from Canary Lane, photographed for Instagram in the kitchen of stylist Carlay Page Summers. For a narrow galley-style kitchen, go with a runner, or try a smaller 3′ x 5′ for something more square and compact. This kitchen found in Australian home magazine Inside Out is not for the faint of heart, but aside from its apparent boldness it also has some super smart small space takeaways, like freeing up counter space by storing knives on the wall and incorporating a calendar onto the cabinet fronts. Set against a rich black wall (in a kitchen uncovered on No Glitter No Glory) this knife set adds a stainless-steel punch amidst the existing matte textures. An effect that most certainly would be lost if hidden in a counter-hoarding butcher block. Apartment Therapy Projects Editor Dabney Frake completely transformed this rental kitchen for about $300 (a feat we applaud regularly). And while there are many, many lessons to take away from this makeover, there’s a simple storage spot that’s often overlooked, and that’s your fridge. Attaching hooks to the side for things like paper towels and stashing away infrequently used appliances on top like a stand mixer saves a ton of much-needed surface area. From Elle Decoration France, a pale, heavenly palette is met with rugged leather handles for a nice juxtaposition of style. This teeny tiny Swedish kitchen featured on Rue Magazine, proves that even if your kitchen is no bigger than the average closet it can still pack in some big style as long as you restrain yourself. A strict monochrome approach to dinnerware keeps it visually uncluttered (allowing the addition of some vintage pieces to feel fresh, rather than stuffy). The writing is definitely on the wall in actress Nina Dobrev’s kitchen featured on MyDomaine, where a painted accent wall acts as a to-do and grocery list. If you have the ceiling height like this kitchen designed by Studio Lifestyle, then big, statement-making pendant shades are a must. When you have just a few cabinet doors and a small stretch of countertops, your best bet for making a decorative splash just might be your refrigerator. Connecticut designer Patrick Mele didn’t let size get in the way of showcasing artwork in this teeny kitchen. In fact, he used every opportunity to show it off. Of of the most powerful design tools is paint. That was certainly the case in this small kitchen makeover on One Kings Lane, whose minty hue (which is actually a removable vinyl) mixed with copper and marble accents is beyond a dream! We all know that small kitchens can be tricky when it comes to adding the unexpected. Think about painting or wallpapering the inside of your cabinets like this kitchen found on Popsugar. Danielle Moss, co-founder of lifestyle blog The Everygirl, kept her palette simple and to the point inside her Chicago apartment featured on Clever. 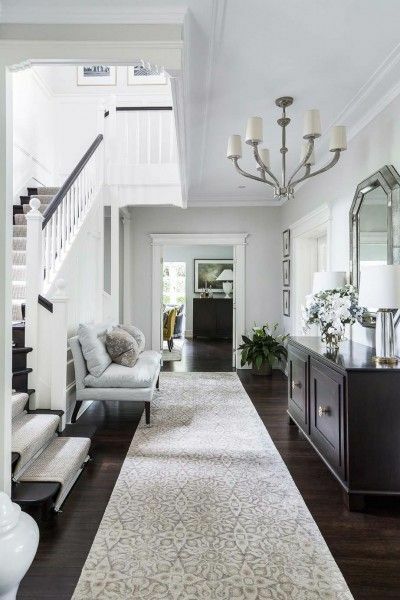 In a narrow space, it’s sometimes best to opt for a simple color scheme like this to keep the look as airy as possible. The backsplash is one of the most underutilized vertical spaces in the kitchen. Here, in the Montreal home of Marlène Deshaies, an additional shelf installed between the upper cabinets and the countertops makes room for an adorable collection of vintage dinnerware. When every little bit of space counts (or there’s a serious lack of cupboards), this is a smart way to make room for more. When you’re a renter, it’s not always feasible to add on-the-wall shelving, even if they are incredibly useful for expanding your surface area. One of our Design Editor’s go-to solutions to this? A cheap baker’s rack, like this one from Target. What the petite London kitchen of Hannah Cecil Gurney (daughter of Claud Cecil Gurney, the founder of bespoke wallpaper company de Gournay), featured on 1stdibs, lacks in square footage, it makes up for in bold jewelry box-like style, like gold leafed walls, bright blue cabinetry and whimsical hardware. So you’ve got a tiny kitchen. Whether a rental space or something to call your own, a foot or two of counter space and maybe a wall to work with if you’re lucky doesn’t leave a ton of room to get creative, but give us an inch and we’ll give you a mile of ideas. 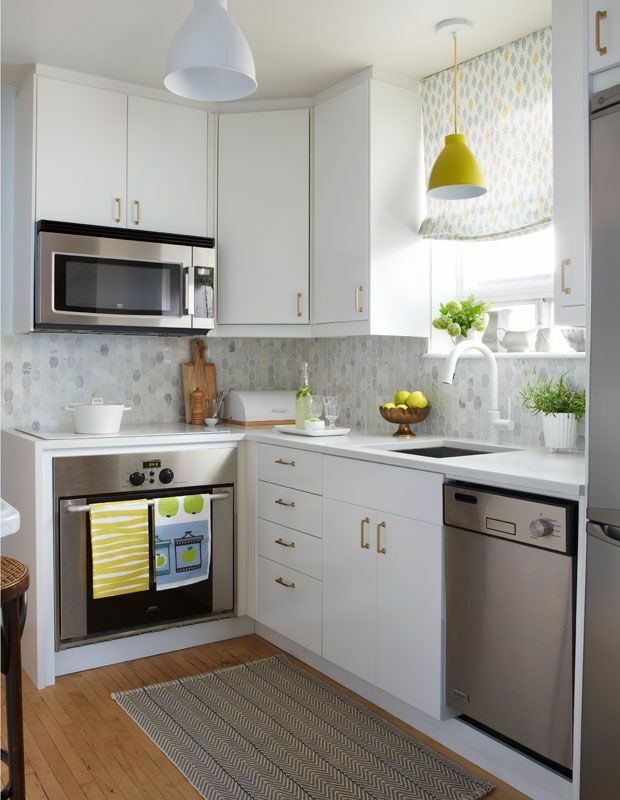 Here, 45 fabulous small kitchens chock full of solutions and inspiration to help you jazz up your tiny space and keep you cooking in style. This little space found on Casa Haus takes some big risks that have huge style payoffs. From the orange Smeg fridge to the minty green cabinetry, it’s easy to overlook the pint-sized floor plan of this candy-colored space. If you have a sliver of a wall open in your kitchen, you can open up a world of storage possibilities with a humble pegboard. A handful of hooks is all you need to make a home for all your gadgets and gizmos if your drawer space leaves much to be desired. What you may lack in square footage could potentially be made up in height. This clever kitchen spotted on One Kings Lane employs some super simple and chic storage solutions as the designer added another row of shelving above the cabinets balanced on wine holders! The ’70s are alive and well in this retro kitchen designed by Reath, whose chartreuse color palette and simple cabinetry give off a groovy feeling. Should you have a small dated kitchen you’re not too happy about, try leaning harder into its era to make the most of it. Looking for that fresh, sun-drenched vibe? All white-on-white (in a shade with warmer undertones) never fails. This New York apartment designed by Alyssa Kapito brings in some super blonde woods to round out the classic look that feels like a breath of fresh air. Plants are a great way to add freshness to a small, stagnant space and, in this kitchen found on SFGirlbyBay, their wild limbs give movement and motion to the area. We love the use of the decorative lighting in this small yet bright kitchen from Lonny. While inset can lights could have been used, the pendants add such a nice touch. This super economical stainless steel shelving unit (a variety of pieces from IKEA’s Grundtal series) in this kitchen included in our Big Book of Small, Cool Spaces provides ample opportunity to display some of your favorite kitchen things, both practical and pretty. Sometimes, all you need to create a small dining area for one or two is a shelf and two barstools, like in this hyper efficient (and totally lust-worthy) kitchen from Polish design site Ladny Dom. This small but mighty kitchen spotted on Digs Digs is certainly a vision of efficiency (the whole apartment is only 40 square meters! ), but its artful use of a glass divider and a clear acrylic dining chair keeps the space carved out yet open and spacious. Ultra glossy kitchens tend to look a bit Euro-mod, but there’s no denying the reflective (read: light-bouncing) properties it offers. This inviting space found via Lonny brings in warm brass cabinetry and an earthy stone backsplash to keep a welcoming vibe. Adding some major wow factor to an already impressive kitchen designed by Studio McGee, these cement tiles take this space to new style heights playing off the deep hunter green, crisp white walls and modern lighting. In a small room, tiles can make a serious design impact (and because you have less square footage, the price is far more approachable). Oh, and if you’re a renter, don’t look away just yet. They sell peel-and-stick floor tiles in a similar style at places like Etsy. If you’re hesitant to go full-on bold with a bright or deep color (but really want something different), perhaps you might consider just a hint of a color like the blush in this kitchen, a super chic Parisian guest house by fashion label Marie Sixtine. Maybe you’re looking for just a peppering of bold to give your kitchen some personality. 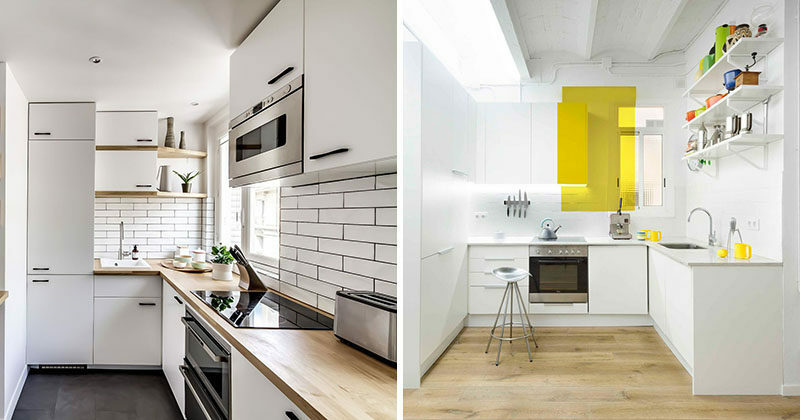 If so, consider what was done in this fun and funky kitchen via Skona Hem, which paired a rich neutral gray with a loud, sunny yellow, giving the space instant personality. Plus, keeping the bright canary shade to just the bottom cabinets avoids overwhelming a small space. If you’ve run out of wall and counter space, look up. Your ceiling is often untapped (and full of potential). Try a heavy-duty ceiling pot rack or try a DIY project like the owners of this small kitchen who created a hanging bar. Find the full tutorial here: A Modern Copper Kitchen Hanging Rack You Can DIY. This rental kitchen makeover by Meghan Pflug for One Kings Lane is gorgeous on so many levels (for real, don’t miss the dismal “before”), but one of our favorite takeaways to try in your own small kitchen is the framed mirror in place of a standard backsplash. It’s easy to clean but tricks the eye into thinking the space is twice as large as it really is. Weren’t blessed with tons and tons of cabinetry to stash away all your tools, pots and pans and the likes? Make your own fortune, instead! Take a cue from this vignette in a kitchen by Jersey Ice Cream Co. that uses a simple yet stunning gold bar and matching hooks to store essentials. Apartment Therapy writer Nancy Mitchell lives in a small studio in Manhattan with very limited counter space. She remedied that by bringing in a compact rolling cart which acts as an island. Rather than trying to cover up this aged brick (there are surely far, far worse problems in the world), this kitchen discovered on Coco Lapine Design made it part of its decor. Whether you have beautiful brick like this or reclaimed wood or vintage tile, consider sticking with it before making big changes. 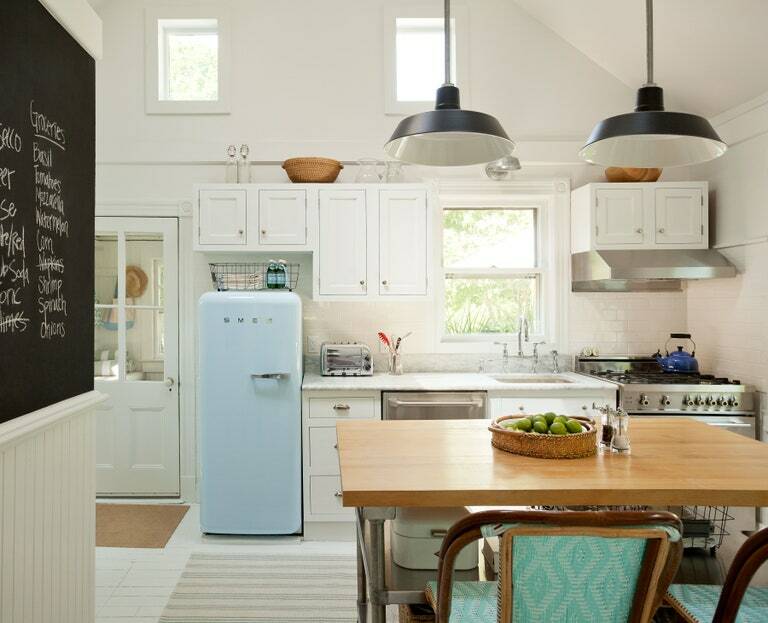 Foregoing upper cabinets altogether and turning to color instead, this funky galley kitchen spotted on Camille Styles is not afraid to take a chance. Not even when it came to traditional faucet finishes. Forget silver or gold and go with mint!